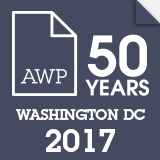 This week is the annual AWP Conference—the organization’s 50th year and right in our backdoor this year! George Mason University is one of the sponsors of the conference, and we’ll have a big presence on panels, at off-site events, and in the bookfair itself. Panel: “The G Word: Writing and Teaching Genre in a Changing Literary Landscape,” with Matt Bell, Katie Cortese, Idra Novey, and Porochista Khakpour, Marquis Salon 6, Meeting Level Two, Marriott Marquis, 901 Massachusetts Avenue NW • Thursday, February 9, 10:30 a.m. Author Signing, George Mason University Booth, Bookfair Booth 501, Walter E. Washington Convention Center, 801 Mt. Vernon Place NW • Thursday, February 9, 1 p.m.
Reading hosted by SmokeLong Quarterly and DC’s Noir at the Bar, with authors E.A. Aymar, Matt Bell. Tara Campbell, Rob Hart, W. Todd Kaneko, Tara Laskowski, Jennifer Pashley, and Amber Sparks, The Pub and the People, 1648 N. Capitol Street NW • Saturday, February 11, 7 p.m.
For more information on programs featuring various Mason faculty, alums, students, organizations and partners, visit the Mason English Department’s website here. And you can always find a list of all my upcoming events here.